Barcelona taxi drivers called off a six-day strike Thursday after the Catalan government unveiled regulations to restrict ride-hailing services like Uber. The strike was called off following a tight vote by members of the Elite taxi union, it said on Twitter. 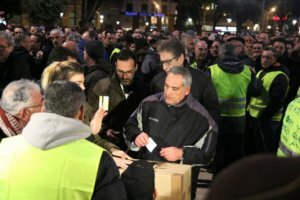 In the vote carried out late Wednesday in Barcelona’s main Catalunya square, 2,508 taxi drivers voted in favour of ending the strike and 2,177 were opposed. Spanish taxi drivers complain that rivals from ride-hailing apps work like taxis despite not being classed as such in law, competing unfairly since they do not face the same regulations and costs. But after taxi drivers said the measure did not go far enough, the regional government said Tuesday that it would allow local authorities in Catalonia – if they deemed it necessary – to lengthen the pre-booking time to a maximum of one hour. Barcelona taxi drivers began their strike on 18 January, while Madrid taxi drivers launched an open ended strike over the same issue on Monday. In recent days, some taxi protests have turned violent, with dozens of vehicles operated by Uber and Cabify vandalised in both cities.